A trip along Great Ocean Road wouldn’t be complete without paying a visit to the copious waterfalls in the area. You might not know it, but the coast is dotted with fabulous waterfalls, nestled in gorges, valleys and among the Beech forest. But which ones are worth visiting? Luckily, I’ve got that covered. So here are the Top 10 Waterfalls to Visit Great Ocean Road. Erskine Falls are by far worthy of the Top 10 Waterfalls to Visit Great Ocean Road. Flowing pretty much year-round, Erskine Falls drop 30 meters into a luscious fern gully. A descent of 300-odd stairs only 100meters from the car park leads to a viewing platform at the base of the falls. Wear waterproof boots if planning on taking river bank paths and river crossing to get closer to the falls (signposts advise against this). Click here for more information on finding Erskine Falls. Lesser known than Erskine Falls, Straw Falls can be found by crossing the Erskine River behind the viewing platform at Erskine Falls and following a thin muddy path along the bank. After about 400meters, Straw Falls will appear on the left, a sheer rock face with flowing water. Look for the sign “Straw Falls” bolted into the rock. Wear appropriate footwear which will grip on the muddy banks. It is likely that you won’t have mobile phone signal. Click here for more information on finding Straw Falls. Another easily accessible waterfall which is largely underrated. The stunning gorge home to Sheoak Falls can be found by driving to a stopping bay on Great Ocean Road. The walk is roughly 500meters over a boardwalk structure that provides views of the ocean before cutting inland. The path turns to concrete and then heads up some earthy stairs before winding down to the falls. Visit after heavy rainfall for most impressive falls. No facilities, but Lorne town centre only 12 minutes away. Click here for more information on finding Sheoak Falls. On the way to Sheoak Falls, a fork in the track gives options to head down to the base of Sheoak Falls (to the right) or up another set of stairs (to the left). Heading up the stairs leads to a viewing platform for Upper Sheoak Falls. The cascade begins from the river behind Swallow Cave and gushes down a sheer rock face. To get the above shot, I followed the track further to a river crossing and a second viewing platform. Waterproof footwear required if river crossing. Only cross if it is safe to do so – when water levels are low. Click here for specific information and directions to Swallow Cave (Upper Sheoak Falls). The turquoise blue water of Phantom Falls is just the icing on the cake that is this pleasant walk. Beginning from the Allenvale Road Carpark (Allenvale Mill Campsite/Carpark), the 3.5km return trail meanders through lush forest before cutting across an orchard on private property. It then heads up an extremely steep gravel hill before reaching the staircase down to the falls. Facilities available at Allenvale Campsite. Unsealed roads are required, but suitable for 2WD. Other loop trails exist in the area. To learn more about other trails, click here. Or, if you’d like a step-by-step itinerary, click here. Henderson Falls make the Top 10 Waterfalls to Visit Great Ocean Road because they’re one of my favourites. No bias or anything…The track begins from the Sheoak Falls Picnic area and is a relatively flat and easy 1.8km walk. The biggest bonus? Access to walk right up to their base. The track can get extremely muddy. Be prepared with some gumboots like my Hunter gumboots – check out my Top 5 Things to Take on a Waterfall Adventure. Make the short deviation to Won Wondah Falls on the way. Though no access to their base, it’s a quick 2mins to the viewing platform. Unsealed roads required to get here, but suitable for 2WD. A stunning waterfall with a cave behind it, Lower Kalimna Falls are found via a 6.5km return trail. This trail also begins from the Sheoak Falls Picnic Area (unsealed road to get there). Continue on for another 1.25kms to Upper Kalimna Falls (making the total hike 8.5kms return). Track is extremely muddy at times and requires appropriate footwear such as gumboots. Check trail conditions before beginning. Click here for more information on finding Lower Kalimna Falls. 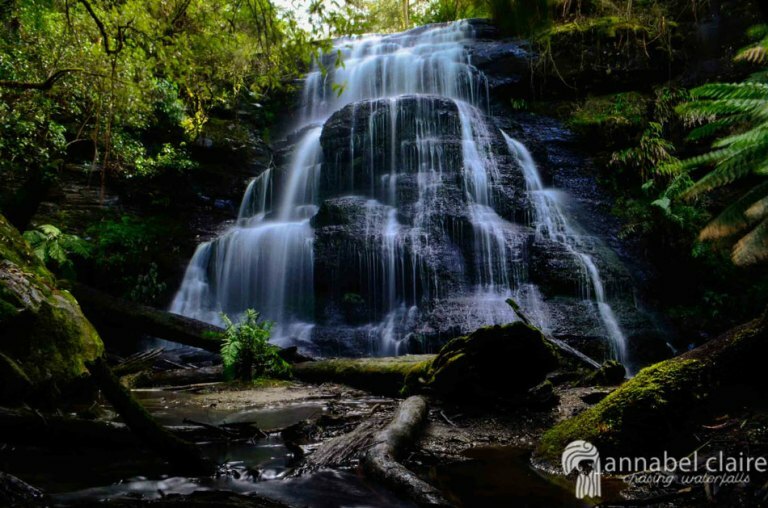 Beauchamp Falls are a beautiful sight located deep in the Beech Forest, roughly 50minutes from Apollo Bay. The 2.5km return trail is moderate with some steep sections and staircases. While there’s no official access to the base of the falls, it is possible to reach the riverbank if being careful. The best thing about Beauchamp Falls? They are fuelled by the Deppler Creek which provides significant water flow year-round. Camping is permitted at Beauchamp Falls. Facilities include 2 drop toilets and picnic tables. Unsealed road is bumpy with potholes so take extra care. However, a 2WD will survive. Click here for more information on finding Beauchamp Falls. Another 15minutes on from Beauchamp Falls, Hopetoun Falls are equally impressive. The 1km (ish) return trail is deceiving due to extremely steep stairs for the majority of the walk. A viewing platform provides a great view, though there are also ways to sneak down closer to the falls. Unsealed roads are bumpy with potholes but doable in 2WD. Click here for more information on finding Hopetoun Falls and getting closer to their base. Last but certainly not least is Triplet Falls. Located another 25minute drive from Hopetoun Falls, the 2km return Triplet Falls trail begins from the car park at the end of Philips Track. Facilities include drop toilets and picnic tables. Little Aire Falls located another 2.5kms or so on from Triplet Falls. It is likely you won’t have mobile phone coverage in this location. Click here for more information on finding Triplet Falls. And there you have it! The Top 10 Waterfalls to Visit Great Ocean Road. As a little disclaimer, these are all best visited after heavy rainfall. I visited these in September 2017 and the weather was perfect – not too cold, not too hot, and yet the waterfalls were in full flow! If you’re planning a trip, be sure to check track conditions before you go. If you’d like specific itineraries for day trips to these waterfalls, you can check out my Waterfall Itineraries! Happy waterfall chasing!